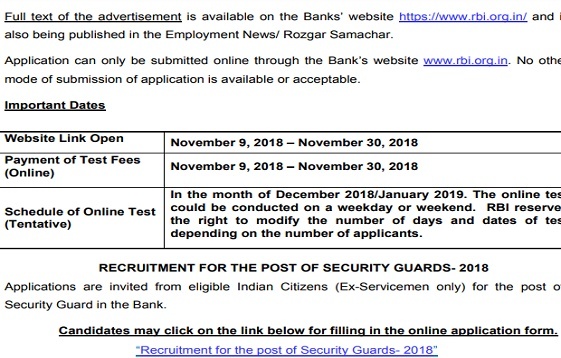 RBI Mumbai Security Guards Recruitment 2018 Notification, State Wise Vacancies, Important Dates, Education Qualification & Apply online process details:- Reserve Bank Of India Recruitment 2018 For the post of " Security Guards" released to inform the details regarding 270 (two hundred seventy) vacancies required & desirable qualification details and other info. 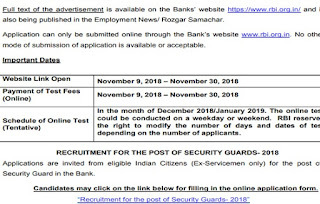 Apply for Reserve Bank Of India Jobs 2018 check now brochure of RBI Mumbai SG Posts & If should have eligible qualifications let's move in to apply online section. Abhyudaya Cooperative Bank Recruitment 2018 Notification For Security Guard (14) Posts released. Abhyudaya Bank looking for a security guard for Mumbai area branches. Candidates find Security Guard Jobs in Mumbai? Download Recruitment 2018 Notification, Check eligibility norms & apply for jobs & attend the selection rounds. The candidates send application forms after the due date not eligible. Surat Peoples Cooperative Bank Ltd Recruitment 2018 Notification:- SPCBL Bharti 2018 For Assistant General Manager (AGM) Job description provided general manager at www.spcbl.in/pages/recruitment 2018. One of the leading Co-Operative Bank of Gujarat invites online applications for the post of AGM from 21/09/2018 onwards. TJSB Sahakari Bank LTD released Manager (Pledge Finance), Officer (Pledge Finance) Recruitment 2018 Notification. Interested or young and dynamic candidates verify TJSB Bank Recruitment 2018 Advt available at tjsbbank.co.in career portal, Submit the resume through online at recruitment@tjsb.co.in before the last date. Complete job description over TJSB Bank visit official site i.e www.tjsbbank.co.in. Dear aspirants IBPS Clerk Notification 2018 Published by Institute of Banking Personnel Selection at www.ibps.in official website. Across India search for Common Recruitment Process For Recruitment Of Clerks VIII 2019-20 Notification download IBPS Clerk 2018 Recruitment Notification PDF now, apply as per the schedule, pay the non-refundable application fee & sent online mode of application form.